Acid reflux or heartburn is a digestive disorder, which occurs when acid from your stomach flows up into the tube connecting your mouth and stomach, known as esophagus. In such a situation, the contents in your stomach come back up your esophageal tract because your lower esophageal sphincter fails to seal off your esophagus from your stomach. Know 9 plant foods at your home that will quickly get rid off your acid reflux and hearburn in a natural way. You may try to eliminate the causes that trigger the acid reflux given below. The acid can cause inflammation in the esophageal lining, resulting in a burning and irritating sensation in your chest and/or throat. This is known as acidity, heartburn and Gastroesophageal reflux disease (GERD). Acid reflux can occur daily, weekly, or less frequently. I have acidity and heartburn feelings sometimes once a week and some times daily or it may not happen for months. Poor digestive health is one of the reasons of low stomach acid production. Eating a heavy meal and lying on your back or bending down. Foods to avoid: Eating some foods such as tomato, citrus fruits, mint, garlic, onions, chocolate, peppermint, etc. You may replace citrus fruits with watermelon, honeydew, cantaloupe which are good for acid reflux. Drinking tea, coffee, alcohol, carbonated drinks, etc. Taking some tablets such as aspirin, ibuprofen. Are you suffering from acidity and heart burn? The best thing to treat your acidity is to avoid triggering foods. You should avoid foods having low pH foods (means acidic foods) and consune high pH foods (means alkaline foods). You may try over-the-counter medications, but their long term use can have side effects. You may try the following natural home remedies for acid reflux that really work without any side effects. Some of these home remedies can cure GERD permanently. You should check with your doctor before trying any home remedy for heartburn. Fennel (pH 6.9) has been in use to treat a number of digestive problems such as indigestion, constipation, heartburn, flatulence and bloating. The active compound in fennel is anethole, which has a carminative effect, soothing the digestive tract and reducing acid and inflammation. Fennel is one of the best means of fighting acid reflux and its regular use is a permanent cure for acidity and heartburn. 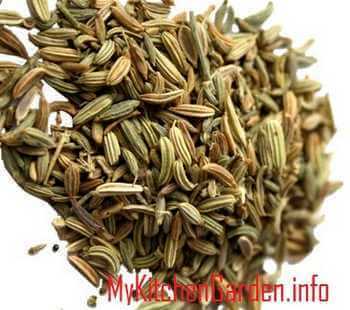 You can chew some fennel seeds after a meal to prevent heartburn. You may add a piece of jaggery with fennel seeds to get relief quickly. It is pointed out that eating jaggery is a good remedy for acidity. The Pregnant and lactating women should, however, not consume large amounts of fennel in their diet. I always chew some fennel seeds after each meals to get hearburn relief fast. I have tried fennel seeds for acid reflux several times and I got instant relief. Basil leaves stimulate stomach to produce more mucous, so it has soothing properties. It also helps reduce excess acid production. Chew on 5-6 basil leaves to get relief from the burning sensation due to acid reflux. The phenolic compounds in ginger absorb stomach acid, reduce the likelihood of stomach acid flowing up into the esophagus, thus relieving gastrointestinal inflammation and irritation. It has therefore been used throughout history as an anti-inflammatory and as a treatment for acid reflux conditions. Ginger in small amount is one of the best foods for acid reflux relief. To get relief from acidity, chew a small piece of ginger. You may keep it in your mouth with a small piece of jaggery and keep sucking on it to calm down your acid reflux. Fenugreek is an effective remedy for heartburn. The Fenugreek seeds are very high in fiber and contain galactomannan which forms a gel in the stomach. The fenugreek helps absorb excess acid and assist in soothing gastrointestinal inflammation and helps to prevent the acidic stomach contents from going into the esophagus. Swallow 1 teaspoon of fenugreek seeds with water before half an hour of each meals to treat your hear burn. In India, fenugreek veggie is made which is eaten with roti or bread. Turmeric has curcumin as an active ingredient, which is highly anti-inflammatory and antibacterial, helping in esophageal inflammation. Because of this, turmeric may relieve Gastroesophageal reflux disease (GERD). It is to be noted that as turmeric is a natural blood thinner, so it should not be used with blood thinning medications. Also it can cause your blood sugar to drop to dangerous levels, so people with diabetes should use it. Mustard can neutralize the acid. The prepared yellow mustard is in vinegar which makes it an alkalizing food. A spoonful will help neutralize the acid that may creep up your throat, and therefore may neutralize the pain of acid reflux. You can eat a teaspoon of prepared mustard after each meal or when you feel a acid reflux symptoms. Bananas (pH 5.6) are known to be very good for people with acid reflux. Bananas secrete a lot of mucus, which protects the intestinal walls from the harmful effects of excessive acid production. Eat a ripe banana for some relief. Papaya is great for digestive system, an excellent treatment for acid reflux. The enzyme, papaine in papaya improve digestion and reduces heart burn. The high water contentof papaya keeps the body hydrated. The potassium in papaya also introduces healthy bacteria into your intestines. It neutralises the acid in the stomach, reducing the reflux. You may eat a cup of ripe papaya daily to keep acid reflux problem at bay. It has been noted that if you chew on licorice and swallow its saliva, your heartburn gets better. It increase mucus production in gastrointestinal tract which acts as a barrier to acid in the stomach and esophagus, healing the damaged tissue and prevent future occurrences of acid reflux. Drinking a tea made by brewing licorice root into a tea is effective at neutralizing stomach acids. Licorice contains glycyrrhizic acid, which can cause complications when eaten in large quantities. Deglycyrrhizinated licorice (DGL), in which a substantial amount of glycyrrhizin has been removed can be used for long term.